Lower back pain is one of the plagues of modern life. As many as 80 per cent of North Americans experience some form of back pain throughout the course of their lives, but thankfully, it’s treatable with the right interventions and therapies. Clinical studies have shown that yoga and regular stretching can be effective at preventing and alleviating some of the worst symptoms. Here are five of the best stretches for fighting lower back pain. Spend five minutes every morning holding each of these poses for one minute. One of the most basic yoga moves, downward facing dog is great for alleviating tension in your back. This pose also helps to stretch your hamstrings, which can cause lower back pain if they’re tight. To get into downward facing dog, start on your hands and knees. Lift and straighten your knees, pulling your hips up to the sky. You want to make one straight line between your hands and your hips and another straight line from your hips to your feet. Your head should be tucked under, your shoulders pulled away from your ears, and your belly drawn in. Breathe deeply throughout the pose. As you breathe, allow yourself to sink deeper into the pose. Try pedaling your heels down toward the floor for an additional stretch in your hamstrings and calves. While downward facing dog stretches your hamstrings and back muscles, cobra gives your back and spine a nice, elongating stretch while opening up the chest. Lie on the ground on your stomach with your legs together. Place your elbows under your shoulders and gently lift your torso up. Think of pulling from your back muscles more than pushing from your arms. Pull your shoulders down and away from your head to lengthen your neck. After breathing here for several breaths, if your body feels it could use an additional stretch, you can put your hands instead of your elbows on the ground. Yoga for the lower back doesn’t get much better than cat-cow. Cat-cow encourages mobility in the spine, and it makes a great warm up for stretches or prior to performing any activity that might tax the back. Start on your hands and knees with your back flat and your abdominal muscles pulled in. On an inhale, let your back sway like a cow’s. As you allow your back to arch through the middle, raise your head and your tailbone. Let your breath and movement be slow and controlled. Then, as you breathe out, round your back upward like a frightened cat. Tighten your abs, lower your gaze and pull your tailbone down. Continue this motion for several breaths. 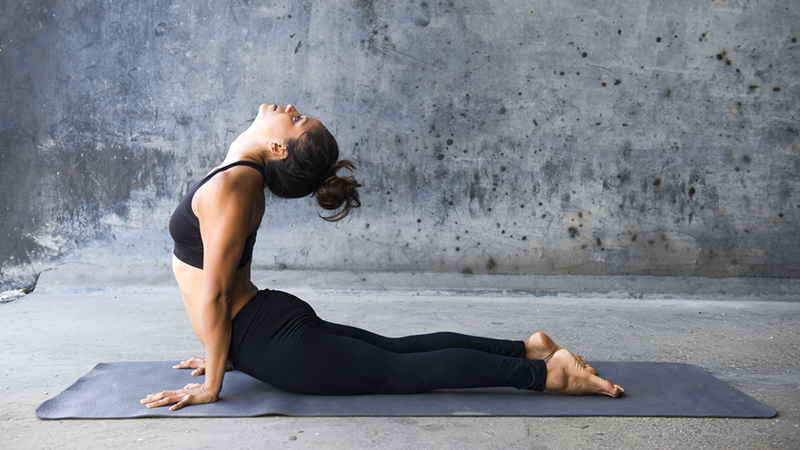 Some yoga stretches aren’t just great for you; they feel great too. Child’s pose is one of these moves. It’s used to lengthen the back, which often becomes compressed throughout the day, as well as to relax the mind. Start on your hands and knees, then shift backward until your bottom is almost touching your heels. Stretch your arms forward and place them on the ground, pulling slightly to elongate your spine. For an additional stretch, try shifting your hips to the left for a few breaths, then to the right. Ahhh. This popular pose is great for the spine and will leave you feeling limber. Lie on your back, with your legs bent and your feet resting together on the floor. Extend your arms out to the side with the palms facing down. Breathe deeply. On an exhale, lower your legs to the right side, easing them to the floor while you turn your head to look in the direction of your left shoulder. Breathe here for several breaths. Then, on an inhale, return to the middle. Repeat on the other side. How Frequently Does Low Back Pain Occur?